This is the second in a series of folding robots to prepare for 4D printing. 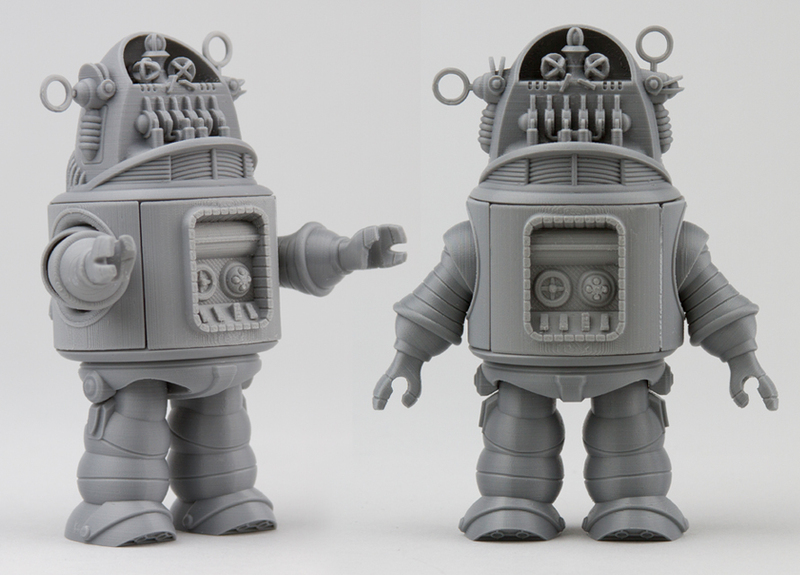 It was inspired by robot called "Robby" which appeared in movie "Forbidden Planet(1956)" and designed. This is the kind of "3D Fan art”. Many transformations were inevitable in order to apply a structure that is suitable for 3D printing but is folded and completed. And we've added new elements that will not look outdated. To do this, I added a lot of my imagination and finally it was born like this. The original Robby robot that inspired me did not look good in proportion. So I tried to make the proportions completely new except for the main features. Because the characteristics of this robot are concentrated on the upper body, the legs are shortened and the size of the head portion that is the best feature of this robot is kept. In addition, the new proportions take into account the time to print to the 3D printer. If the height of the robot is small, it takes less time to print. The cylindrical body is thicker when stretched, narrowing the range of movement of the arms and legs. Therefore, this robot's body is deformed close to a square. Nevertheless, it has been designed to look like a cylinder using the optical illusion effect. This design is all parts (arms, legs), this build is touching the bed area was wide, stable design as a form print in almost any 3D printer. Therefore, even beginners who can not handle 3D printer easily can print easily. And you can get good results on any 3D printer. This design allows the head, arms, and legs to rotate at different angles without the need for assembly, so you can play with it in a variety of ways. In particular, the arm has a double structure so that it can rotate in two directions, so you can take many poses. In addition, the legs are made to protrude to the front and back, and the angle is precisely adjusted so that it does not fall over. The folding robot series will bring a new revolution in 3D printing as a completely new structure robot that can realize various movements simply by folding without needing support or assembly. PS: The ring-shaped parts of this robot's ears are the same in size and shape, so they do not matter if they are left or right.